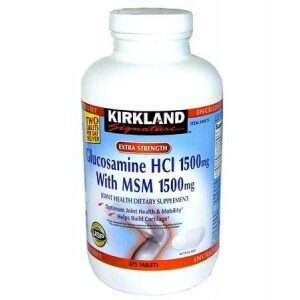 What is Kirkland Signature Extra Strength Glucosamine and MSM? Kirkland Signature Extra Strength Glucosamine and MSM is a joint supplement from Kirkland Signature, Costco’s private label for their products. Besides supplements, they manufacture a variety of other household goods. Kirkland Signature Extra Strength Glucosamine and MSM contains glucosamine HCl along with MSM as a source for sulfur. One thing we liked about it was the USP certification, the United States Pharmacopeia sets standards by which prescription drugs are made. We found no artificial dyes or coloring in Kirkland Signature Extra Strength Glucosamine and MSM. 1 stars out of 5. Chondroitin Sulfate Doesn’t have chondroitin sulfate. Chondroitin makes up glycosaminoglycans which are a component of cartilage. Methylsulfonylmethane (MSM) Has 1500mg MSM, more than the average amount. MSM is a vital source of sulfur for protein and connective tissue synthesis. What does the DS stand for in Cosamin DS? I see you liked Kirkland’s product better because it holds to FDA testing, but it does not chondroten. What is the most complete product I can purchase that holds to testing?